After Tim Cook was elevated to CEO of Apple on Wednesday, gay blogs lit up with the news that he's one of their own. 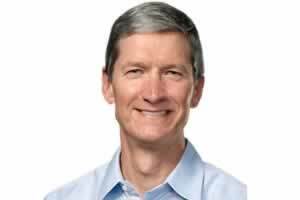 Cook took over the reigns of Apple after the abrupt resignation of Steve Jobs, who will now serve as chairman of the board. But while gay glossy Out earlier this year named Cook the most powerful gay person in America, the all-business Cook has yet to acknowledge he's gay. Reaction on gay sites has been mostly positive. But for the few mainstream media outlets reporting the news, results have been mixed. Felix Salmon, a reporter for Reuters, felt the need to defend his reporting on the subject, saying it would be irresponsible for the media to avoid the issue, which is the same as reporting that Cook is straight. Writing at The Atlantic, Nicholas Jackson said Cook needed to own his sexuality if he's to be crowned the most powerful gay man in tech. “[H]e won't be a role model for the LGBT community until he confirms the rumors and comes out of the glass closet he is assumed to be living in,” Jackson wrote. But, we have to add, doesn't Cook's silence on the issue after appearing on the cover of a nationally circulated magazine speak volumes? For us, that was as courageous a step as any.